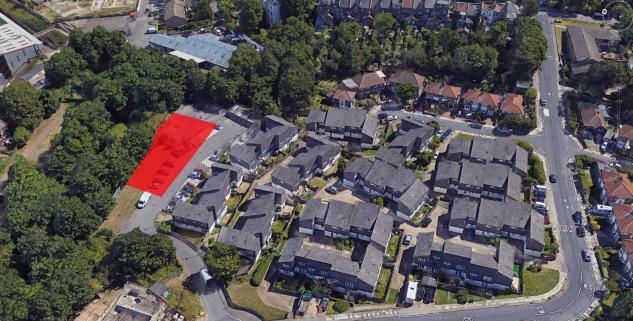 Yesterday this site looked at how Greenwich Council are building some of the fewest new homes in London using council arms-length development companies which can bypass Government caps on building. Greenwich Labour council are building less via that method than just about every other Labour council in London. Given how few they can build directly, the lack of homes built through an arms-length company combined means very few social homes are being built. To demonstrate the problem, next week Greenwich’s Cabinet are looking to approve selling three council owned sites to a private developer – Pocket Living – which would provide “affordable” rents whilst aiming for a 20% profit margin. We know there’s a huge difference between social rents and “affordable”. Claiming this sale means affordable rents are provided means little. It will be “intermediate affordable” which is one of the more expensive types of the ever-more silly “affordable” tag. It’s another chance to provide truly low cost homes gone if the sale approved. If the council built on this land via Meridian Homes it could use the 20% profit margin to provide more homes or reinvest at other sites, or simply build with no outright profit margin and provide more cheaper homes. One of the core reasons for using arms-length development companies is to reinvest all income instead of trying to provide “affordable” homes via private developers who claim developments are unviable if profit margins are less than 20%. Yet using Meridian Home Start isn’t even listed as an option for these sites. Downright bizarre. It’s not even considered despite being the best option for providing much need social homes. 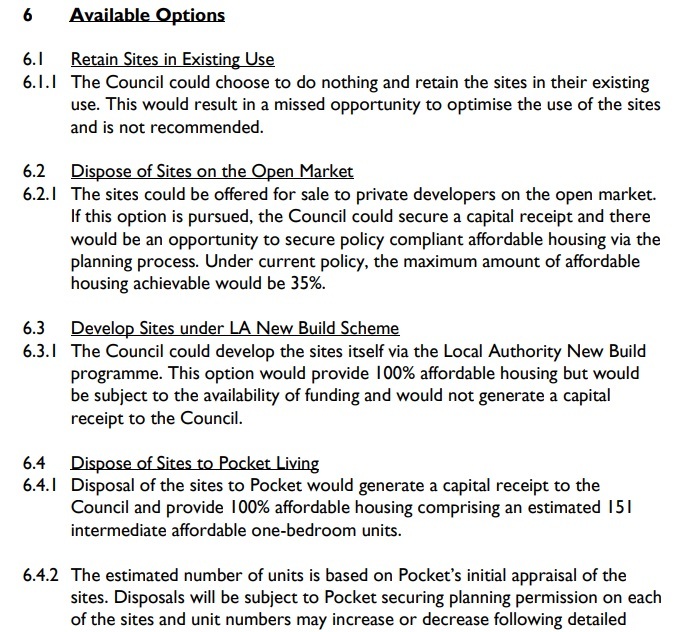 The option “LA (Local Authority) New Build” is different to using Meridian Homes, as LANB is building outright and subject to government restrictions. One argument used for this scheme that it’ll generate £100,000-£130,000 council tax. So would building through Meridian. And then we get onto the developer – Pocket Living – who build very small flats. There’s questions over how healthy this is. The days of council’s building to spacious and healthy standards – the Parker Morris guide – seem forgotten by Greenwich Council. Once again in Greenwich we have to ask who is benefiting from housing policy? Spending £65 million on buying homes off the market at bubble prices instead of using funds to build new homes? Check. Using taxpayer money to pay mortgage deposits which maintains high prices? Check. Taking many years to regulate landlords and then introducing the weakest form possible by only regulating HMO properties? Check. And through all this, developers are profiting as scheme after scheme ensures prices are pushed ever higher whilst the poorest and young see costs further beyond their reach for both private rents and buying homes. And hardly any social homes provided for those in most need. Whilst those stuck in private rentals don’t even have the benefit of a half-decent licensing regime. Combine this with central government policies like “Help to Buy” which have ensured ever increasing prices (much like Greenwich’s more localised schemes) and there doesn’t seem much difference between Conservative Central Government and Greenwich Labour Council when it comes to housing policy, despite all the protestations otherwise. The facts speak louder. Pretty much every action taken by Greenwich when it comes to housing is designed to push demand-side without increasing supply-side. That simply increases rents and house prices and increases inequality. If a Labour council is doing this then what exactly is the point of Labour? Good quality and truly affordable housing should be a bedrock of the party. You don’t have to be a wacky Corbyn obsessive to see that. Their policies would have been seen as pretty far to the right for most of the 20th century, and indeed today. How do we increase supply? I agree with many of the comments in this article but am at odds with what the alternative options are. There’s a desire for affordable housing, yet you seem unwilling to compromise on the development of smaller units by pocket living – reduce size, reduce cost. Surely something has to give? On leaving it to the council to achieve the same outcome but reinvest profits, that’s a great idea in principle but am not convinced about their ability to deliver. This however may be a sweeping and unfair judgement, as I am basing this only on my experience with L&Q. A great way to increase supply is to build on vacant or redundant land, so nothing wrong with these plots as sites for new homes. Ever smaller homes is not a good route to take, and the UK already has the smallest in the developed world (even smaller than Japan I believe). Other high density nations such as the Netherlands and cities with higher densities than London across the developed world build bigger homes. Reducing sizes is a race to the bottom and detrimental to public health. Do I think Greenwich could manage building in the thousands right now? Probably not – though they’ve had since 2011 to build up capacity. Other boroughs started later and are now building or planning in the thousands – Ealing, Newham, Croydon, Lewisham to give just some examples who built up capacity quickly and are building to good quality space standards. If Greenwich hired expertise it could get there, and it would permit more social homes than going down the private developer route as well as less outlay to B&Bs, private landlords etc which is costing the taxpayer very large sums. Building regulations have, to all and intents and purposes, been swept aside in the name of holy profit. Developers are being allowed to build ever smaller dwellings and are cynically exploiting the desparation of buyers to get a toe hold in the ‘London’ market. Pocket Living is just another in the race to the bottom. It’s all very well if you work a 20 hour day and only go home to crash out, but ordinary living requires space for your stuff and somewhere to store them away. When you occupy a 38sqm dwelling, you will be tripping over or sitting on your possessions. None of this would be quite so bad if the properties were cheap. Greenwich Council just doesn’t want poor people living in the borough even if the area is crap.